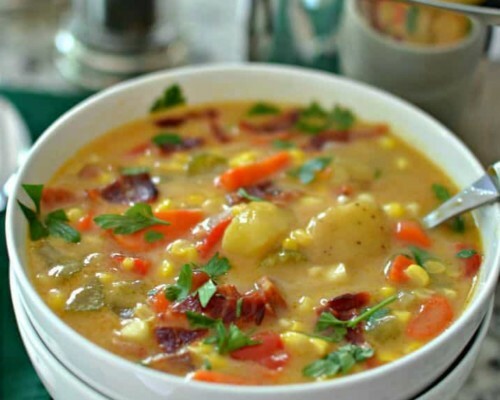 Corn Chowder is plump full of fresh sweet corn, tender chunks of potato and crispy bacon in a creamy chicken broth base that is lightly seasoned and flavorful. I know for some of you it is almost too hard to think about soup weather when it is still in the eighties and nineties but for this soup loving family it is always a good time of the year for soup. There is nothing quite like a chunky creamy chowder to fill your hungry tummy! 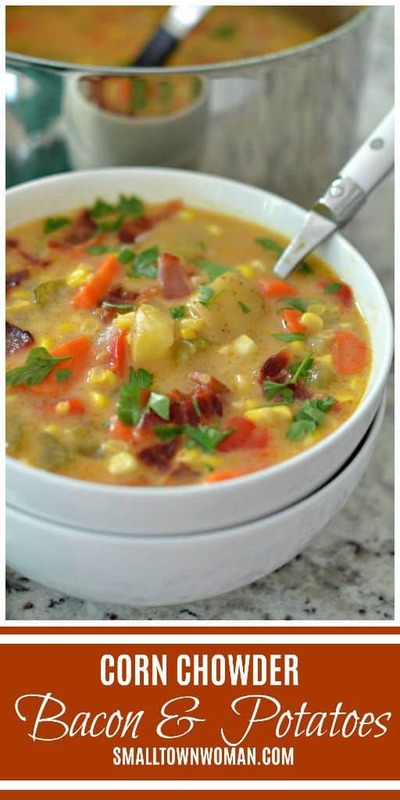 This Corn Chowder Recipe is chock full of bacon, potatoes and corn and is so quick to come together therefore it is definitely doable for a weeknight meal. 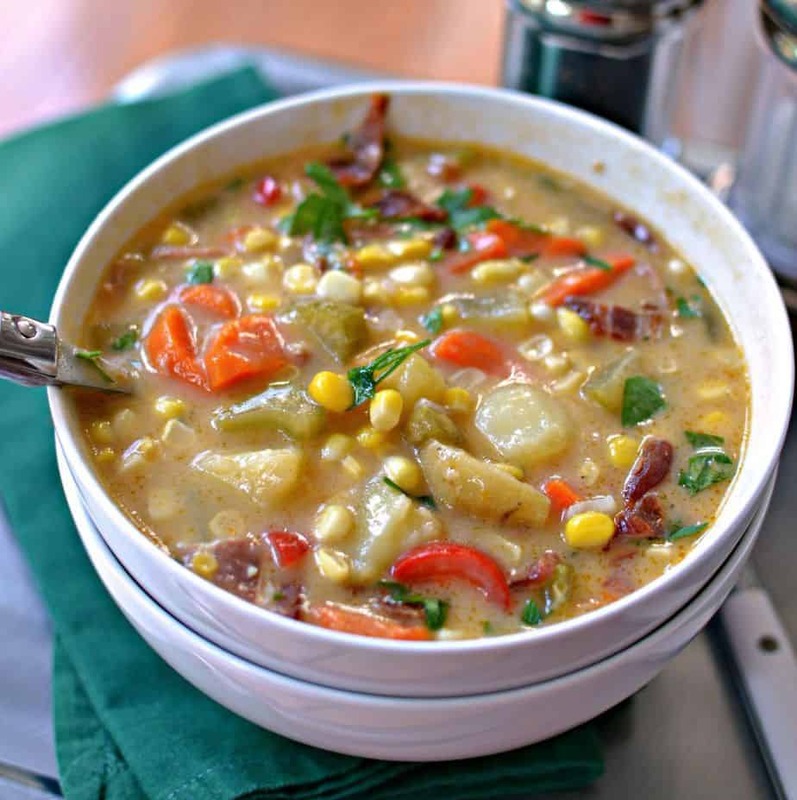 Summer is a perfect time for Corn Chowder because the farmers are bringing the best of the best sweet corn to market. What is the difference between chowder and soup? I thought you would never ask. Chowder is a soup but it is chunkier and thicker and it is usually cream based. Similarly bisque is also a thick soup but in contrasts it is generally smooth while chowder is chunky. Chowder, bisque, soup no matter it’s definition seems like it is all good for my soul and consequently warms my heart. 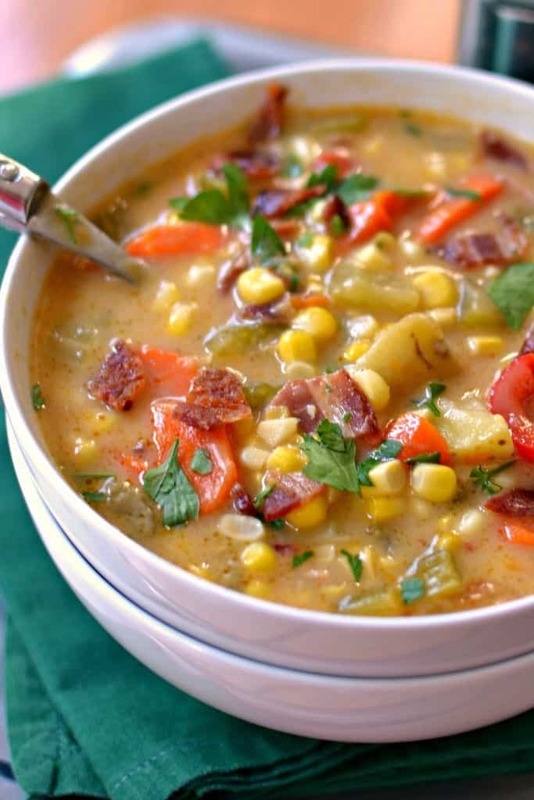 How to make Corn Chowder Recipe! First of all cook the bacon reserving 1-2 tablespoons of bacon grease. Coarsely chop bacon and set aside. Heat bacon grease in large stockpot or dutch oven. Add celery, carrots, onions, potatoes and corn and cook for 5-7 minutes. Add red pepper and cook for additional 3-5 minutes. Stir in paprika, onion powder, garlic powder and ground cayenne pepper and cook for 30 seconds. Add chicken broth. Bring to low boil and simmer until potatoes are soft. Stir in cream. Pull one cup of broth from stockpot (trying not to get any vegetables). Mix with flour to create a slurry. Whisk into soup using fork and bring back to a low boil. Simmer until slightly thickened for about 2-3 minutes. Finally add chopped bacon and parsley and serve. Three easy ways to remove corn kernels from the cob! After shucking your corn and removing the silks you need to cut the kernels from the cob. This is a messy adventure so here are three ways that might make it a little easier. Use a large wide bowl with a much smaller tall bowl in the bottom. Balance the ear of corn vertically on the smaller bowl and carefully cut the kernels off hence letting them fall below into the big bowl. Use a large cutting board and lay the corn horizontally. Carefully cut the kernels off. Rotate several times to cut and remove all of the kernels consequently leaving most if not all the kernels on the cutting board. Above all this is my favorite method because it is quick and the only thing you will have to wash is the cutting board. Use a large cutting board and stand the corn up vertically. Starting halfway down the corn carefully cut and remove kernels. Turn it upside down and remove the rest of the kernels. As a result this split in the middle seems to keep the kernels from flying off the cutting board. Finally look at all that delicious goodness just waiting to jump into your mouth! 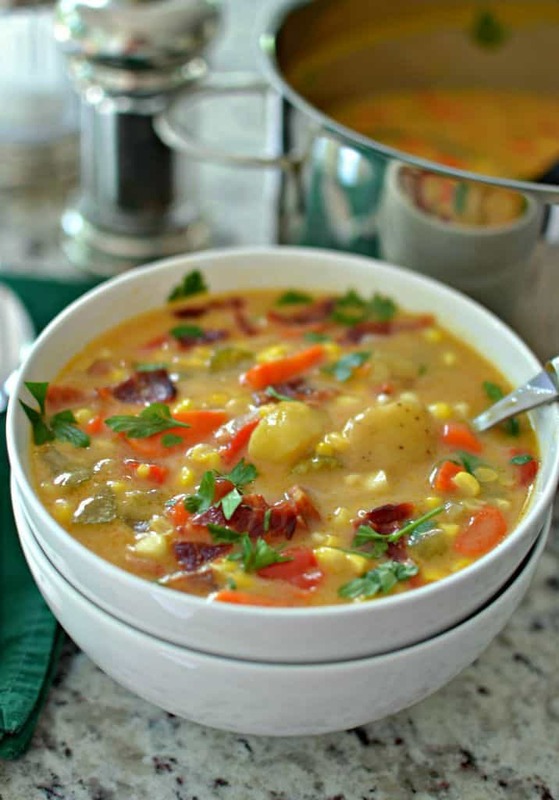 Folks it really does not get much better than this Corn Chowder with Bacon and Potatoes. You should certainly put the ingredients on your shopping list today. Even more delicious soup recipes you will love! This post was originally published January 29, 2015 and was republished July 9, 2018. 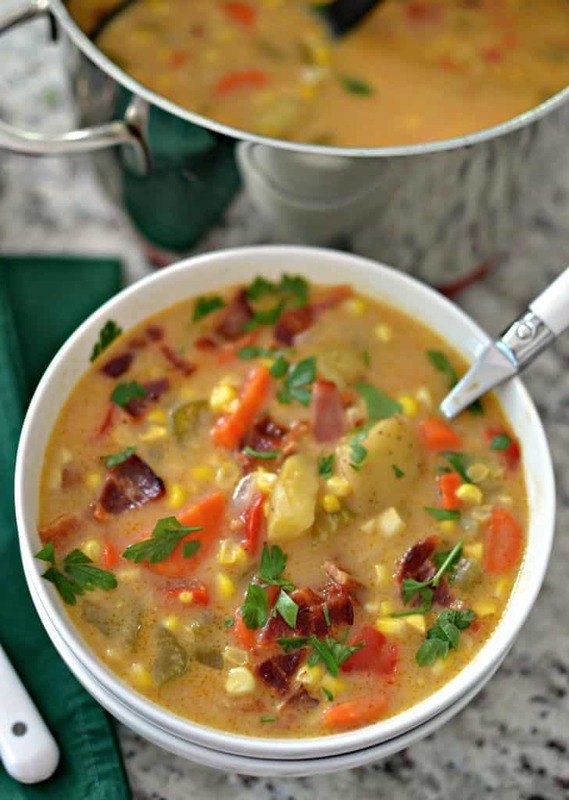 Corn Chowder is plump full of fresh sweet corn, chunks of potato and crispy bacon in a creamy chicken broth base that is lightly seasoned and flavorful. Cook bacon in skillet or in oven on baking sheet at 375 degrees until crispy; approximately 15 minutes. Remove to paper towels; reserving bacon grease. When cooled coarsely chop bacon. Shuck and remove silk from corn. Cut kernels from the ears of corn. Heat bacon grease in large stockpot or dutch oven over medium heat. Add corn, celery, carrots, onions and potatoes and cook for 5-7 minutes stirring once or twice. Add red pepper and cook for another 3-5 minutes. Add paprika, onion powder, garlic powder and cayenne; cook for 30 seconds. Add chicken broth. Bring to low boil and simmer until potatoes are soft. Add chopped bacon and parsley just before serving. Salt and pepper to taste. If you were to make your bacon, potato and corn colder into a crockpot meal when would you add the heavy cream? Sorry I was having hosting problems earlier. Let me see if that one is fixed. Yes it is fine now. I have become better about tracking these thing. I would say this makes about ten cups. I am sure you understand that does not mean bowls. Actually….I meant how many cups of corn. Sorry should have been more clear with my question! No problem! About 1.5 cups. This looks great. Fast, too. I was going to adapt it to my pressure cooker. I’m thinking 5 minutes after the potatoes and broth are added. Then cream after quick release of pressure. Then add finishing touches. Sounds like a great plan!! Let me know how it turns out!